Author: Margaret Maruani. Series edited by: Trutz von Trotha †, Rainer Geißler. Inequality between men and women in the workplace in France and other European societies has been the focus of Margaret Maruani’s comparative work. She now has collected the important findings of her intercultural, trans-disciplinary and problem oriented analyses in this volume. The results hitherto remain ambivalent: With regard to education and access to employment, progress has been substantial, whereas differences in remuneration, career possibilities, insecure job situations and a higher rate of unemployment for women still endure and are recurring. Margaret Maruani has been research director of the Centre National de la Recherche (CNRS) at the Institut de recherche sur les sociétés contemporaines in Paris since 1992. She initiated the interdisciplinary and international research group Marché du travail et genre (MAGE) in 1995 and founded the journal Travail, Genre et Sociétés in 1999. 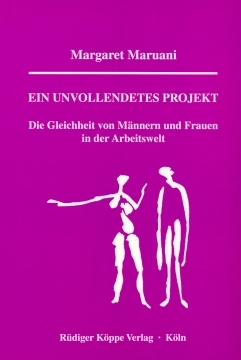 In 2000 she was awarded the Helge Pross Prize “for the sociology of gender and the family”.